Caption: Panarama of old and rare tulips dating from 1595 to 1927, including Duc van Tols, Single Earlies, Double Earlies and Triumph tulips. Photo by Mary Ellen Wall (2011). Click image for a larger version. For over 1000 years, tulips have emerged each spring bringing beauty, wonder, love -and aspiration - to all who passed their way. During the 1630s, about 50 years after tulips were first brought to Holland, their beguiling beauty created a frenzy to own them, with huge sums being paid for single bulbs. Today, most of those old Dutch tulips are extinct, but even more have emerged to take their place. This website celebrates the great old tulips of the past, and documents the old tulips that survive to this day � hoping increased awareness of them will help preserve them for future generations. Hortus Tulipus, which is located near Ann Arbor, Michigan, supports this objective by collecting, raising and preserving some of the most spectacular of these old - and now almost forgotten - tulips. Today, tulips are divided into 15 categories (divisions). This website includes tulips from all of these divisions if the tulips existed prior to (or were introduced during) 1960 -- although we make a few exceptions. These tulips will be found under By Category on this website. Please note that for historical purposes we divide several of the 15 divisions into subsections, making, in effect, 19 categories of tulips. This website also devotes extensive coverage to a special type of tulip that no longer is grown or marketed by commercial tulip growers, and which are not included in the above 15 divisions. These are the rare and magnificent tulips that caused Tulipmania in Holland during the 1630s -- broken tulips. While many of these broken varieties are very old (the oldest in our collection dates from 1620), a few newer varieties are introduced from time to time, primarily by members of the Wakefield and North of England Tulip Society. These newer varieties are included as well, along with the non-broken "breeders" which may break, and which are bred to produce new tulip cultivars which, in turn, may break. Much more information on these special tulips will be found under Broken and Breeders on this website. At present, this website lists more than 1300 old tulips dating from about 1585 to 1960, along with their date of origin and classification. As other old tulips are identified, they will be added to the appropriate lists. With time, we hope to provide Cultivar Datasheets � including photographs, descriptions, and growth characteristics � for a large percentage of these tulips. If you raise old tulips, and would like to �adopt a tulip� and author a datasheet for it, please Contact Us. Arrangements may be made to visit the collection during the blooming cycle of the tulips and to photograph and paint them (no, you can't paint on them -- or pick them). To make arrangements, please Contact Us. Hortus Tulipus does not sell tulip bulbs, but will provide links to selected sources that do. 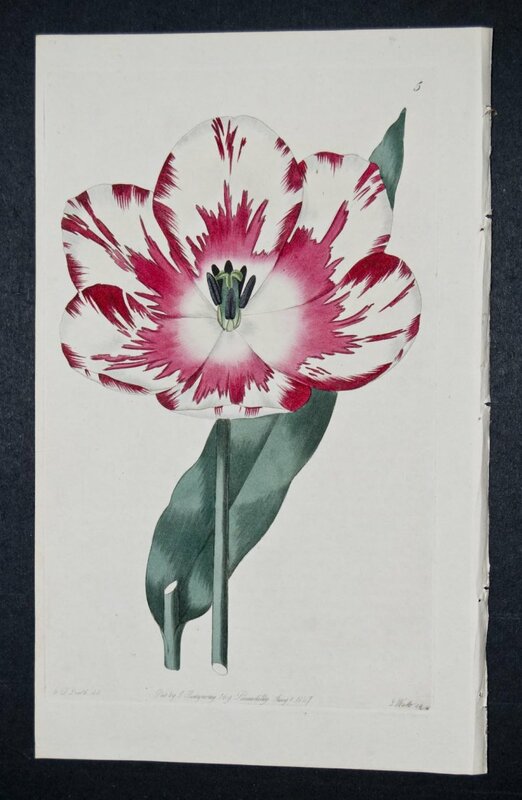 We will trade bulbs for old and rare cultivars, tulip reference materials, and old engravings and illustrations of tulips not now in our collection. Methods of handling additional excess bulbs have not yet been determined. We greatly would appreciate your contributions to this website, including authorship of articles, completion of cultivar datasheets, contribution of photos, provision of additions to cultivar lists and sharing of any other insights that will help make this website more complete and useful. Please Contact Us before submitting content. 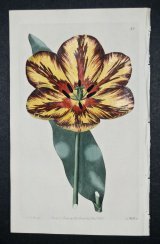 Caption - Upper Right: Rose Brillante Tulip (Tulipa Gesnariana var. fulgens) Left: Strong's King Tulip - Tulipa Gesneriana var. regia. These hand-colored botanical engravings of old English Florists' tulips are from Robert Sweet�s work The Florist�s Guide and Cultivator�s Directory or drawings of the choicest Florists flowers. The work was published in London by James Ridgeway between 1827 and 1832. It featured engravings after Edwin Dalton Smith. which were engraved by J. Watts and then printed on fine woven, watermarked paper. Robert Sweet received early training as a gardener, and utilized this skill to become a foremost name in the horticultural world. 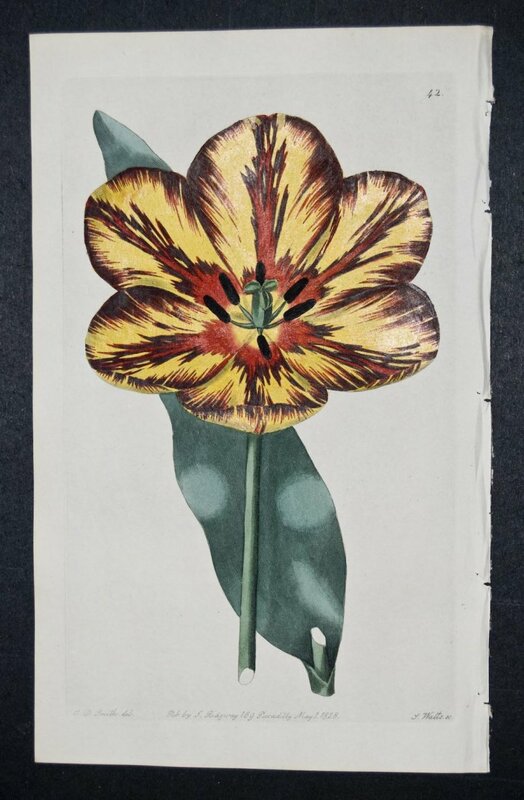 Florist�s Guide, originally published as a periodical, featured some of the most favored botanical illustrations including engravings of showy auriculas, striking tulips, and elegant roses. (Text and images courtesy of Trillium Antique Prints and Rare Books. Collection of Hortus Tulipus. Click image for a larger version.